The film had a panel at the San Diego Comic-Con on July 22 and was released in North America on July 23, 2010, and in the United Kingdom on August 18, 2010. Salt grossed $294 million at the worldwide box office and received generally positive reviews, with praise for the action scenes and Jolie's performance, but drawing criticism on the writing, with reviewers finding the plot implausible and convoluted. The DVD and Blu-ray Disc were released December 21, 2010, and featured two alternate cuts providing different endings for the film. Evelyn Salt (Angelina Jolie) is being tortured in a prison in North Korea on suspicion of being an American spy. Her boyfriend, arachnologist Mike Krause (August Diehl), generates so much publicity about Salt's imprisonment that the CIA is forced to arrange a prisoner exchange, despite the agency's policy against it. Salt's CIA colleague Ted Winter (Liev Schreiber) greets Salt at the border. As they drive away, Mike proposes marriage, despite Salt's admission to Mike that she is in fact a CIA operative. Two years later, on Salt and Mike's wedding anniversary, a Russian defector named Oleg Vasilyevich Orlov (Daniel Olbrychski) walks into Salt's office. Salt interrogates him, with Winter and CIA counterintelligence officer Darryl Peabody (Chiwetel Ejiofor) observing. Orlov claims that, on "Day X", highly trained Russian sleeper agents known as "KAs" will destroy the U.S. Orlov tells them that Agent "KA-12" will assassinate Russian president Boris Matveyev (Olek Krupa) at the funeral of the American Vice President. Orlov reveals that KA-12 is named Evelyn Salt, and lie detectors confirm his entire story. Peabody orders Salt be detained, while Orlov kills two agents and escapes. In the confusion, Salt is able to escape from the building, running barefoot through the street. While the CIA is searching for her, Salt discovers that her husband was kidnapped. A while later at the funeral, Salt appears to succeed in killing President Matveyev, and then surrenders herself. Matveyev is declared dead. Salt escapes again and heads to a barge where Orlov is hiding with other sleeper agents. In a series of flashbacks, Salt recalls growing up in the Soviet Union and being trained with other children. On the barge, Orlov welcomes her back and has Mike killed in front of her. When Salt shows no reaction, Orlov is convinced she is loyal and begins briefing her on her next mission. She is to rendezvous with another KA who will help her assassinate the American president. She kills Orlov and the other agents before leaving. She then meets with KA Shnaider (Corey Stoll), who uses his cover as a Czech NATO liaison to get Salt into the White House. Once inside, Shnaider launches a suicide attack to force agents to move the President (Hunt Block) to an underground bunker, accompanied by Winter. Salt follows them and manages to enter the bunker before it is sealed. The U.S. President learns that Russia has mobilized its nuclear arsenal in response to their president's death. He orders American nuclear weapons readied in response. CIA Agent Winter suddenly kills everyone except the President and introduces himself as Nikolai Tarkovsky, another member of the KA. Winter incapacitates the President and begins aiming nuclear missiles at Mecca and Tehran to incite a billion Muslims against the United States. Salt tries to persuade Winter to let her inside the sealed room, but then he sees a television report saying President Matveyev is alive and well; Salt had used spider venom to cause a simulated death of Matveyev. Winter refuses her entry and reveals that Mike's kidnapping and murder and her blown cover were all his idea. Winter plans to place full blame for the nuclear attacks on Salt. Salt breaks into the room before he can launch the missiles. The two wrestle for control of the nuclear football, with Salt aborting the missile strikes before being captured. As Salt is being led out in chains, Winter grabs a pair of scissors, ready to attack her or to defend himself if necessary. She unexpectedly hooks her chain around Winter's neck and jumps over the stair railing, strangling him to death. On the helicopter ride to be interrogated, Peabody questions her. Salt explains that she killed Winter because he orchestrated the death of her husband, and promises to hunt down the remaining KA agents if freed. Peabody is convinced after receiving a text that Salt's fingerprints were found on the barge where the sleeper agents were killed, supporting her story. Salt is allowed to escape, jumping out of the helicopter into the river below and escaping into the woods. A closing narration suggests that the new U.S. President is another KA agent. In an alternate ending, Salt, disguised as a nun, arrives at the building where she was trained as a child in the former Soviet Union. She confronts Orlov in his office, telling him that she came to inform him that she's "free". The two then engage in a brief fight, where Orlov is then shot by Salt multiple times; she is later seen by the water as she pushes Orlov, who is tied to a large rock, into the water, and watches him drown. The building is then shown exploding. The early development of the script began while Kurt Wimmer was doing interviews promoting Equilibrium. In a November 2002 interview, he discussed what scripts he was working on. He stated that "I have several scripts—foremost of which is one called The Far-Reaching Philosophy of Edwin A. Salt—kind of a high-action spy thriller..." In another interview, Wimmer described the project as "very much about me and my wife". The plot incorporated many elements from Equilibrium, with an oppressive and paranoid political system of brainwashing that gets overthrown by one of its high-ranking members who rebels due to an emotional transformation. With the shortened title Edwin A. Salt, the script was sold to Columbia Pictures in January 2007. By July 2007, the script had attracted the attention of Tom Cruise. Terry George was the first director to join the project, and he also did some revisions to the script, but he soon left the project. Peter Berg was the next director to consider, but he too, eventually dropped out for undisclosed reasons. A year later it was confirmed that Phillip Noyce would direct. Noyce was attracted to Salt for its espionage themes, which are present in most of his filmography, as well as the tension of a character who tries to prove his innocence yet also does what he was previously accused of. Schreiber was chosen for his "hidden emotionality" and his performance in Defiance. Initial discussions took place in 2008 between Tom Cruise and Noyce about Cruise playing Edwin A. Salt. These discussions were ongoing for more than a year between the pair and their representatives. It was finally decided that Cruise was unable to commit to the script, because he feared that the character was too close to his Mission: Impossible character Ethan Hunt. Cruise decided to work on Knight and Day instead. The filmmakers tried to differentiate the character from Hunt, but eventually came to accept they were too similar and decided not to change the characteristics of Salt. Noyce said "But, you know, he had a valid point. It was kind of returning to an offshoot of a character that he'd already played. It's like playing the brother, or the cousin, of somebody that you played in another movie". Columbia Pictures executive Amy Pascal suggested Angelina Jolie to Noyce, who had often spoken to Jolie in the past about a desire to create a female spy franchise. Pascal even invited Jolie for a Bond girl role, but the actress playfully replied that she was more interested in playing James Bond himself instead. Jolie was sent Salt's script in September 2008 and liked it. Wimmer, Noyce, and producer Lorenzo di Bonaventura went to visit Jolie at her home in France to discuss a possible script and character change. Writer Brian Helgeland helped with the character development and dialogue of the script based on the notes that came out of those discussions with Jolie and to accompany the gender change, the title character's name was changed to Evelyn Salt. One of Jolie's requests was to rework the third act, which originally had Salt rescue his wife and son from a coalition of villains, because she did not believe a mother would neglect her child in this kind of situation. Wimmer decided to then make Salt more crucial to the villain's schemes, and add a sequence where Salt breaks into "a place harder than Fort Knox"—after considering Camp David, Wimmer settled on the White House. When asked if the script written for Cruise was the same for Jolie, he said "I think that it's just been a continual process, obviously accelerating by changing the central character. But the ideas—the locomotive of ideas that drive the film are the same. An undercover CIA operative is accused of being a Russian mole, and has to go on the run to defend himself. That's been the same since day one. The tone of the film has changed in this evolution. In the same way, I guess, as—you know—action thrillers have changed along the lines of the Bond films and the Bourne films". On February 19, 2009, it was reported that Liev Schreiber would play the role of Ted Winter, Evelyn Salt's friend and colleague in the CIA. Three days later Chiwetel Ejiofor named as CIA Officer Peabody, who is in pursuit of Salt. Noyce said Ejiofor, whom he first saw in Dirty Pretty Things, seemed to have the "intelligence and disarming sort of obsessiveness" that a counter-intelligence officer would need. August Diehl, who played Salt's husband Mike Krause, came after a recommendation from Jolie's partner Brad Pitt, who had worked with Diehl in Inglourious Basterds, and Daniel Olbrychski was chosen for Orlov because Andrei Konchalovsky told Noyce that such an evil Russian character could only be played by a Polish actor. On a budget of $110 million, principal photography took place mostly on location in New York City and Washington, D.C. from March to June 2009. Noyce decided to avoid "typical post-card views of Washington DC" to reflect "the more day-to-day environment of massive federal buildings inhabited by the typical bureaucrat". The opening sequence in North Korea was shot at the Floyd Bennett Field, with an extra who had experience with prisoner exchange acting as a consultant. Salt's rendezvous with Orlov was shot on the "Frying Pan", a former lighthouse ship, now moored in the Hudson River, at 26th Street in New York. The outside of the KA training facility was the Makaryev Monastery in Russia, while the interior was the Russian Orthodox Cathedral of the Holy Virgin Protection in New York's East Village. Filming for a chase sequence took place in Albany on Water Street near the Interstate 787 ramp between April and May. Studio production took place at Grumman Studios in Bethpage, Long Island, New York. While the film was in post-production, di Bonaventura became dissatisfied with some scenes. Steven Zaillian was brought for uncredited rewrites, and reshoots, mostly of action scenes, were held in New York during January 2010. Filming also took place in upper Manhattan's neighborhood Washington Heights on 157th St and Riverside Dr. Some scenes were also filmed outside of Manhattan including The Bronx, Queens, Staten Island, and in Westchester County. After Jolie had just given birth to twins, she spent time training before filming to get fit in order to perform almost all of the stunts herself. Bonaventura said, "She is so prepared and so ready and gung-ho, she'll do any stunt. We had her jumping out of helicopters, shooting, jumping off of all sorts of things and infiltrating places that are impossible to infiltrate". Salt's fighting style was described as a mixture of Muay Thai, Shaolin Kung-Fu, and Jeet Kune Do, which was considered by the stunt team the most suitable for Jolie's physique, and Krav Maga, for its rawness and aggressiveness. Noyce wanted to film the scene where Salt hangs from the edge of the building in a studio with chroma key, but Jolie insisted on doing it herself in the actual location. On May 29, 2009, filming was temporarily halted after Jolie suffered a minor head injury during filming an action scene. She was taken to a hospital as a precautionary measure and released on the same day with no serious injuries, allowing filming to resume. Salt's escape after being captured in St. Bartholomew's originally involved her jumping off a building into a window cleaning machine, but budgetary constraints caused the scene to be changed into a car chase. Computer-generated imagery (CGI) was used extensively throughout the film to create environments and elements, such as bullet holes and flames. More dangerous objects such as a taser or the handcuffs used to strangle Winter were also made from CGI. Five companies were responsible for visual effects. The two most involved were CIS Vancouver and Framestore. CIS Vancouver recreated the White House since the crew did not have permission to shoot in the building, and made a digital elevator shaft for the scene where Salt goes down into the White House bunker. Framestore was responsible for the assassination attempt on the Russian president, which combined actual shots of St. Bartholomew's Church, a digital recreation of the church's interior, and scenes with actor Olek Krupa falling down a collapsing floor. Female CIA officers were consulted about the creation of disguises, leading to the scene where Salt undergoes subtle changes to disguise herself as a Czech. The "sweet and caring" blonde Salt dyeing her hair black would represent the shift to Chenkov, the menacing Russian agent. For the scene where Salt disguises herself as a Major, pictures of Angelina Jolie were treated on Adobe Photoshop to create a believable male version, with the resulting image being used by the make-up team as an inspiration for the prosthetics. Director Phillip Noyce has said that due to the extensive usage of flashbacks, "there was always going to be a mountain of alternative material that would not fit into the theatrical version". The film ended up having two extra versions, the director's cut and the extended cut—which Noyce refers to in his audio commentary as the film's original cut—both included on the DVD and Blu-ray Disc deluxe editions. The director's cut was described by Noyce as "my own personal take on the material, free from the politics and restrictions of producers, studio or censorship ratings". Four minutes of film are added, leading to a running time of 104 minutes. More flashbacks are added, and the violence is amped up—for example, Mike being drowned rather than shot to death. The ending is also different: in the bunker scene, Winter shoots the President instead of only knocking him unconscious, and a media report during the final scene reports that the new US president had been orphaned on a family visit to Russia, implying he is also a sleeper agent. Noyce has described this ending as "an ending yet just a beginning—and it's an ending that turns the whole story on its head". The extended cut increases the running time by only one minute, but rewrites the plot by removing, rearranging and adding scenes. The ending has Salt escaping from CIA custody and going to Russia, where she kills Orlov—his death scene at the barge doesn't appear in this cut, along with the facility where new child spies are being trained being blown up at the end of the cut. Salt: Original Motion Picture Soundtrack was released on July 20, 2010 on iTunes and on August 11, 2010 as on-demand CD-R from Amazon.com. The music was composed by James Newton Howard and released by Madison Gate Records. The song "Orlov's Story" includes a Russian lullaby which music editor Joe E. Rand found at Amoeba Music, and which served as inspiration for the choir heard in other tracks—but the chants in the rest of the score are only random syllables, as Rand and Howard thought actual Russian words would be a spoil about Salt's allegiance. All tracks written by James Newton Howard. The film's marketing campaign included a panel at the San Diego Comic-Con on July 22, 2010, and an episodic advergame titled "Day X Exists", where players watched webisodes and performed missions to unveil the terrorist plot. It was released in North America on July 23, 2010. It was released on August 18 in the United Kingdom, despite poster advertisements suggesting it would be released on August 20. The deluxe unrated-edition Blu-ray Disc and DVD was released on December 21, 2010 by Sony Pictures Home Entertainment. It includes three versions of the film: the original theatrical film and two additional unrated extended cuts not seen in theaters with two alternate endings. A theatrical-edition DVD was also released. In the home video charts, Salt debuted at first in the rentals and third in sales. Sony predicted an opening weekend take in the low-$30-million range, while commentators thought it would come in closer to $40 million and beat Inception for the number one spot at the box office.Salt opened in 3,612 theaters, with an opening day gross of US$12,532,333—$3,470 per theater—and on its opening weekend, $36,011,243—$9,970 per theater—behind only Inception, which made $42,725,012 in its second weekend. Salt also grossed $15 million from 19 minor international markets. On its second weekend, it declined in ticket sales by 45.9% making $19,471,355—$5,391 per theater and placed number three behind Dinner for Schmucks, but by opening in 29 countries that same weekend, it grossed $25.4 million internationally. Salt ended up grossing $118,311,368 in the United States and Canada and $175,191,986 in other countries, for a worldwide total of $293,503,354. Salt received generally positive reviews from critics. Review aggregation website Rotten Tomatoes gives the film a score of 63% based on 238 reviews, with a rating average of 6/10. The site's critical consensus reads: "Angelina Jolie gives it her all in the title role, and her seasoned performance is almost enough to save Salt from its predictable and ludicrous plot." Metacritic, which assigns a weighted average score out of 100 to reviews from film critics, gave the film a score of 65 based on 42 reviews, indicating "generally favorable reviews." Many reviewers highlighted the coincidence of Salt getting released shortly after the reveal of real Russian sleeper agents in the Illegals Program, with a few comparing Salt to one of the agents, Anna Chapman. Jolie at the San Diego Comic-Con in 2010 on the Salt panel. The actress' performance was considered one of the film's strong points. Kirk Honeycutt of The Hollywood Reporter said that, "While preposterous at every turn, Salt is a better Bond movie than most recent Bond movies, as its makers keep the stunts real and severely limit CGI gimmickry". Chicago Sun-Times critic Roger Ebert gave the film four stars (his maximum), saying "Salt is a damn fine thriller. ... It's gloriously absurd. This movie has holes in it big enough to drive the whole movie through. The laws of physics seem to be suspended here the same way as in a Road Runner cartoon." Time magazine reviewer Richard Corliss praised the action scenes and Noyce's persistence in keeping a serious tone—"he ignores the story's preposterous elements and lets the audience decide whether to laugh, shudder or both". Empire's William Thomas praised Jolie's performance remarking that "when it comes to selling incredible, crazy, death-defying antics, Jolie has few peers in the action business", and The Village Voice's Karina Longworth considered that original star Tom Cruise would never express the protagonist's ambiguity as well as Jolie. Among negative responses, The New Yorker's David Denby said Salt "is as impersonal an action thriller as we've seen in years", finding the supporting cast underexplored—"the tricky plot locks them into purely functional responses". Claudia Puig of the USA Today considered the film a "by-the-book thriller" with Jolie's performance as the only distinguished feature. Lawrence Toppman of The Charlotte Observer was mostly critical of the writing, describing the film as absurd, overplotted and incoherent, and saying the villainous schemes "would have been called off 20 years ago at the latest, when the Soviet Union dissolved". Steven Rea of The Philadelphia Inquirer described Salt as "commendably swift and progressively inane", saying the script was a "sloppy concoction of story elements from '70s espionage classics" that ended up not working right with its "nonsensical setups and wildly illogical twists". James Berardinelli of Reelviews considered that, while the film was fast-paced and the action scenes competently shot, the plot was predictable and "the spy aspects, which are by far the most intriguing elements of the movie, are shunted aside in favor of spectacular stunts and long chases". Salt received one Academy Award nomination, for Best Sound Mixing (Jeffrey J. Haboush, Greg P. Russell, Scott Millan and William Sarokin), which it lost to Inception. The film won Best Action/Adventure Film at the Saturn Awards, with Angelina Jolie being nominated for Best Actress, and the Deluxe Unrated Edition being nominated for Best DVD Special Edition. At the Taurus World Stunt Awards, stuntwoman Janene Carleton's jump on a moving truck won Best Overall Stunt by a Stunt Woman, and the film was nominated for Best Stunt Coordinator and/or 2nd Unit Director. It was also nominated for Satellite Awards for Cinematography and Original Score, a Golden Reel Award for Sound Effects and Foley, a People's Choice Award for Favorite Action Movie, and two Teen Choice Awards. The film was nominated for a Visual Effects Society Award for Outstanding Supporting Visual Effects in a Feature Motion Picture but lost to Hereafter. Director Phillip Noyce was optimistic about a sequel, saying "Hopefully within a couple of years, we'll have another one. Angelina's so great in this part. When audiences see the movie they're going to feel like it's only just the beginning." Producer Lorenzo di Bonaventura also expressed further interest: "Angie, I know, loved that character, and would love to explore the character some more first and foremost." Noyce later said he had other projects and would not participate. "Those 3 Blu-ray Disc cuts represent just about everything I have to offer on Evelyn Salt. If there ever is a sequel, better it's directed by someone with a completely fresh take on what I believe could be a totally entertaining and complex series of stories." On June 6, 2011, Wimmer was announced as screenwriter, but Jolie equivocated, "if it comes together right". On December 10, 2012 Sony Pictures announced hiring screenwriter Becky Johnston (known for The Prince of Tides, Seven Years in Tibet, and Arthur Newman), as well as producers Lorenzo di Bonaventura and Sunil Perkash. ^ a b c "Salt (2010)". Box Office Mojo. Amazon.com. July 23, 2010. Retrieved December 1, 2010. ^ Wimmer, Kurt (Ludwig Van) (December 11, 2001). "EQUILIBRIUM discussion". CHUD.com. Archived from the original on July 31, 2011. Retrieved January 23, 2011. ^ Stax (December 4, 2002). "10 Questions: Kurt Wimmer". IGN. News Corporation. Archived from the original on July 31, 2011. Retrieved January 27, 2010. ^ "Salt Makes Paranoid Dystopia Hot Again". io9.com. Gawker Media. July 23, 2010. Archived from the original on 2011-07-31. Retrieved November 5, 2010. ^ Siegel, Tatiana; Kit, Borys (January 27, 2007). "Columbia Sprinkles 'salt' On Slate". The Hollywood Reporter. Archived from the original on July 31, 2011. Retrieved January 23, 2011. ^ Fleming, Michael (July 27, 2007). "Tom Cruise sweet on 'Salt' role". Variety. Reed Business Information. Archived from the original on July 31, 2011. Retrieved January 23, 2011. ^ "Salt Peppered With Cruise". IGN Entertainment. News Corporation. June 27, 2007. Archived from the original on August 20, 2007. Retrieved February 28, 2010. ^ Campbell, Christopher (December 20, 2007). "Peter Berg to direct Cruise in 'Edwin A. Salt'?". Moviefone. AOL. Archived from the original on 2011-07-31. Retrieved July 30, 2011. ^ Fleming, Michael (June 30, 2008). "Phillip Noyce to direct Col's 'Salt'". Variety. Reed Business Information. Archived from the original on July 31, 2011. Retrieved February 28, 2010. ^ "Phillip Noyce: Salt – The Treatment". KCRW. July 21, 2010. Archived from the original on July 31, 2011. Retrieved January 24, 2011. ^ a b c d e f g h Noyce, Phillip. Commentary track:Salt. Salt DVD. ^ a b c d e Fischer, Paul (June 22, 2009). "Exclusive: Phillip Noyce Talks "Salt"". Dark Horizons. Archived from the original on February 26, 2010. Retrieved January 27, 2010. ^ a b c "Salt Production Notes" (PDF). Columbia Pictures. Archived from the original (PDF) on July 31, 2011. Retrieved January 27, 2011. ^ Fleming, Michael (August 11, 2008). "Jolie replaces Cruise in 'Salt'". Variety. Reed Business Information. Archived from the original on 2010-02-26. Retrieved March 23, 2009. ^ Clint, Morris (February 17, 2009). 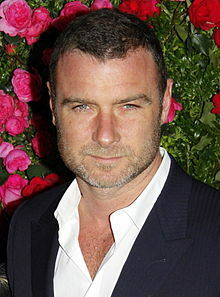 "Liev Schreiber eyes Salt (Updated!)". Moviehole. Archived from the original on February 26, 2010. Retrieved February 25, 2010. ^ Fleming, Michael (February 23, 2009). "Chiwetel Ejiofor joins Noyce's 'Salt'". Variety. Reed Business Information. Archived from the original on 2010-02-26. Retrieved February 25, 2010. ^ Fritz, Ben (July 22, 2010). "Movie projector: 'Salt' to challenge 'Inception' in tight box-office race". Los Angeles Times. Tribune Company. Archived from the original on July 31, 2011. Retrieved July 23, 2010. ^ "First Look at Angelina Jolie in Salt". ComingSoon.net. CraveOnline. March 3, 2009. Archived from the original on 2010-02-26. Retrieved January 27, 2010. ^ Murray, Rebecca (March 3, 2009). "Filming Begins on Salt Starring Angelina Jolie". About.com. The New York Times Company. Archived from the original on February 26, 2010. Retrieved December 28, 2009. ^ "Angelina Jolie and Salt Filming Albany, New York Latest News!". The Insider. CBS Interactive. April 24, 2009. Archived from the original on February 26, 2010. Retrieved December 28, 2009. ^ "Angelina Jolie Gearing Up To Film More 'Salt'". Access Hollywood. NBC Universal. December 16, 2009. Archived from the original on February 26, 2010. Retrieved December 28, 2009. ^ "Albany filming for Jolie movie continues". WTEN. Young Broadcasting. April 24, 2009. Archived from the original on July 18, 2011. Retrieved August 13, 2010. ^ "Angelina Jolie Lands at Grumman Studios". Grumman Studios. January 15, 2009. Archived from the original on February 12, 2011. Retrieved January 23, 2011. ^ a b "'Salt' needed pinch of fixing". The New York Post. News Corporation. January 10, 2010. Archived from the original on July 31, 2011. Retrieved January 23, 2011. ^ Siegel, Tatiana (April 24, 2010). "Top scribes reap pic rewrite riches". Variety. Reed Business Information. Archived from the original on July 31, 2011. Retrieved January 23, 2011. ^ a b The Ultimate Female Action Hero. Salt DVD: Sony Pictures Home Entertainment. ^ "Sneaks 2010 'Salt'". Los Angeles Times. Tribune Company. January 17, 2010. Archived from the original on 2010-02-26. Retrieved January 27, 2010. ^ "Angelina Jolie back filming on "Salt" after head injury on set!". The Insider. CBS Interactive. June 1, 2009. Archived from the original on February 26, 2010. Retrieved December 28, 2009. ^ Desowitz, Bill (July 29, 2010). "Shaken with Salt". Animation World Network. Archived from the original on August 3, 2010. Retrieved January 27, 2011. ^ Grasmere, Robert. Commentary track:Salt. Salt DVD. ^ Spy Disguise: The Looks of Evelyn Salt. Salt DVD: Sony Pictures Home Entertainment. ^ a b c d Morris, Clint (December 21, 2010). "Philip Noyce". MovieHole. Retrieved January 23, 2011. ^ a b c Schaffer, R.L. (December 6, 2010). "Salt: Deluxe Unrated Edition DVD Review". IGN. News Corporation. Archived from the original on July 31, 2011. Retrieved January 23, 2011. ^ a b Phillips, Jevon (December 17, 2010). "'Salt' DVD release stirs Phillip Noyce's spy senses". The Los Angeles Times. Tribune Company. Archived from the original on July 31, 2011. Retrieved January 23, 2011. ^ a b Wieselman, Jarett (December 20, 2010). "Three types of 'Salt'". The New York Post. News Corporation. Archived from the original on July 31, 2011. Retrieved January 27, 2011. ^ "Salt (Original Motion Picture Soundtrack)". iTunes Store. Archived from the original on July 31, 2011. ^ Rand, Joe E. Commentary track:Salt. Salt DVD. ^ Davis, Erik (July 8, 2010). "Comic Con Thursday Schedule Announced". Moviefone. AOL. Archived from the original on July 31, 2011. Retrieved July 8, 2010. ^ Barnes, Brooks (May 16, 2010). "Using Online Games to Get Movie Audiences Involved". The New York Times. The New York Times Company. Archived from the original on 2011-07-31. Retrieved February 12, 2011. ^ "Angelina Jolie Filming Action Scene for Salt". ComingSoon.net. CraveOnline. April 27, 2009. Archived from the original on 2010-02-26. Retrieved January 27, 2010. ^ "Salt Worldwide Release Dates". Sony Pictures. Archived from the original on February 15, 2010. Retrieved February 25, 2010. ^ Michael (October 19, 2010). "Angelina Jolie's SALT DVD Date & Details". MoviesOnline. Archived from the original on July 31, 2011. Retrieved November 24, 2010. ^ Latchem, John (December 30, 2010). "'Despicable Me,' 'Inception' Top Home Video Sales Charts". The Hollywood Reporter. Nielsen Company. Archived from the original on July 31, 2011. Retrieved January 23, 2011. ^ Fritz, Ben (July 23, 2010). "'Salt' may shake up weekend box office". Los Angeles Times. Tribune Company. Archived from the original on July 31, 2011. Retrieved January 27, 2011. ^ "Salt (2010) – Daily box Office Results". Box Office Mojo. Amazon.com. July 23, 2010. Retrieved July 26, 2010. ^ Fritz, Ben (July 26, 2010). "Company Town: 'Inception' worth its salt". Los Angeles Times. Tribune Company. Archived from the original on July 27, 2010. Retrieved January 27, 2011. 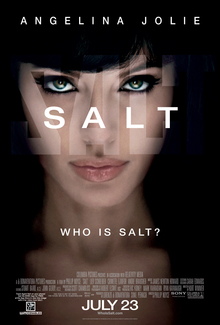 ^ "Salt (2010) – Weekend Box Office Results for July 23–25, 2010". Box Office Mojo. Amazon.com. July 25, 2010. Retrieved July 26, 2010. ^ "Weekend Box Office Results for July 30 – August 1, 2010". Box Office Mojo. Amazon.com. August 1, 2010. Retrieved August 3, 2010. ^ Subers, Ray (August 3, 2010). "Around-the-World Roundup: 'Inception' Still Spinning on Top". Box Office Mojo. Amazon.com. Retrieved January 27, 2011. ^ Stewart, Andrew (August 7, 2010). "'Inception' tops overseas box office". Variety. Archived from the original on July 31, 2011. Retrieved January 27, 2011. ^ "Salt (2010)". Rotten Tomatoes. Fandango. Retrieved November 11, 2018. ^ a b Longworth, Karina (July 20, 2010). "Salt's Jolie: The First (Ambiguous) Action Heroine". The Village Voice. Village Voice Media. Archived from the original on July 31, 2011. Retrieved February 12, 2011. ^ Travers, Peter (July 21, 2010). "Salt". Rolling Stone. Archived from the original on July 31, 2011. Retrieved February 12, 2011. ^ a b Thomas, William. "Salt Review". Empire. Bauer Media Group. Archived from the original on July 10, 2011. Retrieved February 12, 2011. ^ a b Corliss, Richard (August 2, 2010). "Angelina Jolie: Worth Her Salt". Time. Time Inc. Archived from the original on 2011-07-31. Retrieved February 6, 2011. ^ a b Puig, Claudia (July 23, 2010). "Angelina Jolie in 'Salt' shakes up the standard spy thriller". USA Today. Gannett Company. Archived from the original on July 31, 2011. Retrieved February 6, 2011. ^ Honeycutt, Kirk (July 16, 2010). "Salt – Film Review". The Hollywood Reporter. Nielsen Business Media. Archived from the original on November 23, 2010. Retrieved August 25, 2010. ^ Ebert, Roger (July 21, 2010). "SALT (PG-13)". Chicago Sun-Times. John Barron. Archived from the original on 2011-07-31. Retrieved July 22, 2010. ^ Denby, David (February 8, 2010). "Spy Vs. Spy". The New Yorker. Condé Nast Publications. Archived from the original on July 31, 2011. Retrieved February 6, 2011. ^ Toppman, Lawrence (July 22, 2010). "Listen to the doctor: Cut out 'Salt'". The Charlotte Observer. The McClatchy Company. Archived from the original on July 31, 2011. Retrieved February 12, 2011. ^ Rea, Steven (July 23, 2010). ""Salt": Spy thriller with lots of action, not much else". The Philadelphia Inquirer. Philadelphia Media Network. Archived from the original on July 31, 2011. Retrieved February 12, 2011. ^ Berardinelli, James (July 21, 2010). "Salt". Reelviews. Archived from the original on 2011-07-31. Retrieved February 6, 2011. ^ "Nominees for the 83rd Academy Awards". oscars.org. Archived from the original on July 31, 2011. Retrieved January 25, 2011. ^ "The 37th Annual Saturn Award winners" (PDF). Academy of Science Fiction, Fantasy & Horror Films. Archived from the original (PDF) on May 4, 2012. Retrieved July 30, 2011. ^ "2011 Taurus World Stunt Awards". Taurus World Stunt Awards. Archived from the original on 2011-07-31. Retrieved July 30, 2011. ^ "Official 2010 WINNERS" (PDF). International Press Academy. Archived from the original (PDF) on July 31, 2011. Retrieved July 27, 2011. ^ "2011 Golden Reel Award Nominees: Feature Films". Motion Picture Sound Editors. Archived from the original on July 31, 2011. Retrieved July 30, 2011. ^ "People's Choice Awards 2011 Nominees". People's Choice Awards. Archived from the original on July 31, 2011. Retrieved July 30, 2011. ^ Kaufman, Gil (2010-07-12). "'Twilight Saga: Eclipse' Leads New Teen Choice 2010 Nominees". MTV. Archived from the original on July 31, 2011. Retrieved July 30, 2011. ^ "Angelina Jolie – Salt 2 To Be Made In 'A Couple Of Years'". Contactmusic.com. July 23, 2010. Archived from the original on July 31, 2011. Retrieved October 3, 2010. ^ Tilly, Chris (November 8, 2010). "Exclusive Salt 2 Update". IGN. News Corporation. Archived from the original on November 10, 2010. Retrieved January 23, 2011. ^ Gallagher, Brian (June 6, 2011). "Sony Pictures Commences 'Salt' Sequel For Angelina Jolie". Deadline Hollywood. Mail.com Media. Retrieved June 6, 2011. ^ Kemp, Stuart (December 22, 2012). "UK Independent screenwriter Johnston". The Independent. London. Retrieved 19 May 2013. ^ "Bangkok Post screenwriter Johnston". Retrieved 19 May 2013. ^ Kit, Borys (December 10, 2012). "Hollywood Reporter screenwriter Becky Johnston". The Hollywood Reporter. Retrieved 19 May 2013. ^ Gallagher, Brian (December 10, 2012). "Salt 2 Gets Write Becky Johnston". movieweb.com. MovieWeb. Retrieved December 10, 2012.